Welcome to my first blog income and traffic report. A few people have asked me why I would want to publish details of my blog income and traffic online. Won’t you be embarrassed? Do you really want the world knowing your business? You get the idea. Having followed some of the best bloggers online, I think there is a huge opportunity for millennials to use blogs and online businesses to rapidly increase their income and get them on the road to Financial Independence. When you look at the stories of Ruth Soukup and Michelle Schroeder-Gardner, it is clear to see that blogging can and does change people’s lives. 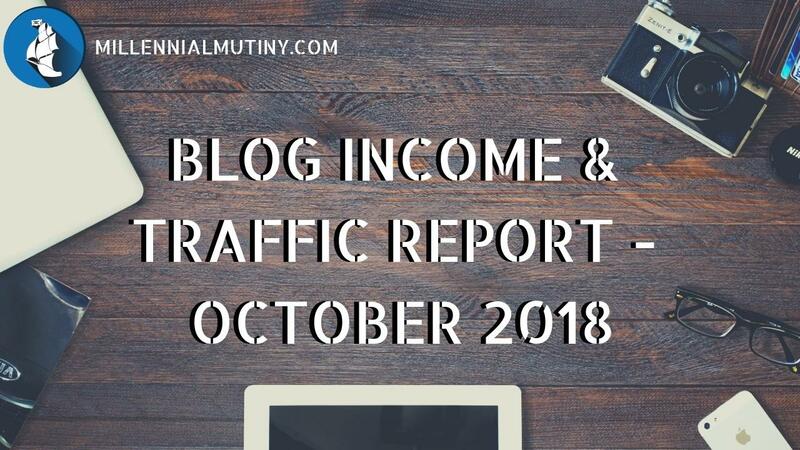 So Why Post An Income & Traffic Report? October was a super busy month for me in the Financial Planning business. We had a great month and set some new records. This meant that I didn’t have as much spare time as I would have liked to write articles for the blog. I posted 7 articles in October and the most popular of those articles so far has been the first of my series on Financial Resilience. I have been busy preparing the first product for sale on the blog. It started out as a budget planner for use with the envelope budgeting system which I recommend, but it has evolved to be more of a full financial freedom planner. It now includes a budgeting planner, a net worth tracker and a ‘dream life’ calculator (which is designed to help you work out how much your dream life will cost annually and also then figure out how much capital you need to sustain it). I am still very much focused on building out great content for my blog and I am trying to post 2 times a week. In October this has been more like once per week, but I am letting myself off given how busy the month was. I am going to ease off on myself a little bit in November also as the end of the year is always a really busy time in the Financial Planning business. I have set myself the task of having the ‘Financial Freedom Planner Bundle’ (as I am not going to call it) live on the blog by the end of the year. This will be challenging as I am learning some new skills and need to build out some landing pages and other content for the launch. October was my best month yet for traffic, although the numbers are still super, super tiny. I started my blog in early August 2018, so I am now around 3 months in. I have really enjoyed the process of writing for and creating my blog and it is a passion that I pursue in my spare time. I am happy that I have doubled my users and added around 44% to my page views. I have also started to see just a couple of referrals from Google, meaning that my blog is beginning to appear in some search results. I have read that it can take from 6-12 months for a site to begin to appear in Google on a regular basis and that it can take even longer in crowded niches like personal finance. I am expecting it to take at least a year to see big traffic numbers from Google and possibly even longer. For next month, I am going to continue to read and post helpful comments on other great blogs that I follow and in addition I am going to get started with Pinterest. My blog income for October was (drum roll please….) ZERO! In the future I want to be more active with my own products, affiliate links and ads, however there has been a lot to do in the past 3 months. I have built the design of the site, written all of the content thus far and added some back-of-house systems to make everything run smoothly. My expenses were very minimal this month. I use the Kajabi platform to build and host the blog, as well as manage my e-mail lists and e-mail campaigns, host my products and process payments. I paid for Kajabi a year-in-advance and got a sweet deal with all sorts of bonues thrown in, at much less than the usual price. I use Canva to create the artwork for most of the site. It is super simple to use and you can create some really beautiful artwork on there without being a graphic designer. I mostly use the free images and graphics that they have available on there, but occasionally they don’t really fit the bill. In this situation, Canva gives you access to a much larger library of paid images, that cost only $1 for a single use. I used two paid images in October hence $2 spent. Not too bad! I will most likely subscribe to the Canva paid version at some point in the future which then gives you access to all the paid images. While I am still getting my blog off the ground, I am happy to just pay $1 a go. All in all, I am happy with the progress the blog is making, although it is a little slower than I would like. I think the site is starting to look pretty reasonable and I still have loads of ideas for new content and improvements.